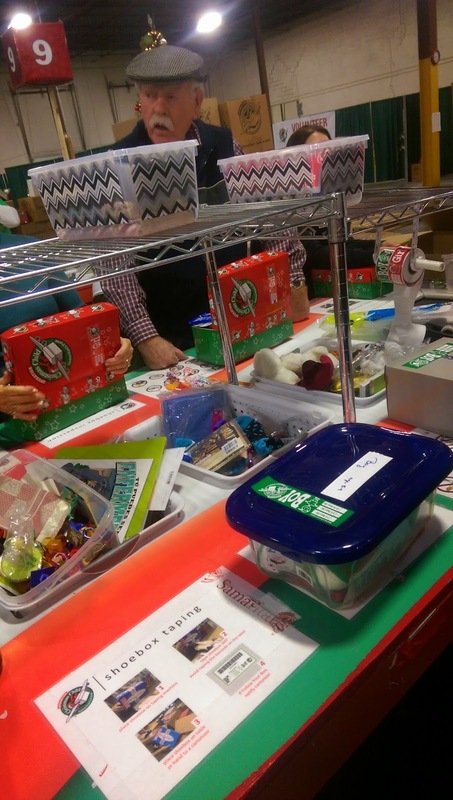 I first learned about Operation Christmas Child when I moved from Virginia to Maryland. My church was (and is) one of many collecting shoebox gifts to send to children worldwide. For many years, it's been a cherished tradition to get together with friends for "packing parties." This year, a processing center for the shoeboxes opened in my area - this is the last stop for the boxes before they are shipped to their final nation and distributed to the children. 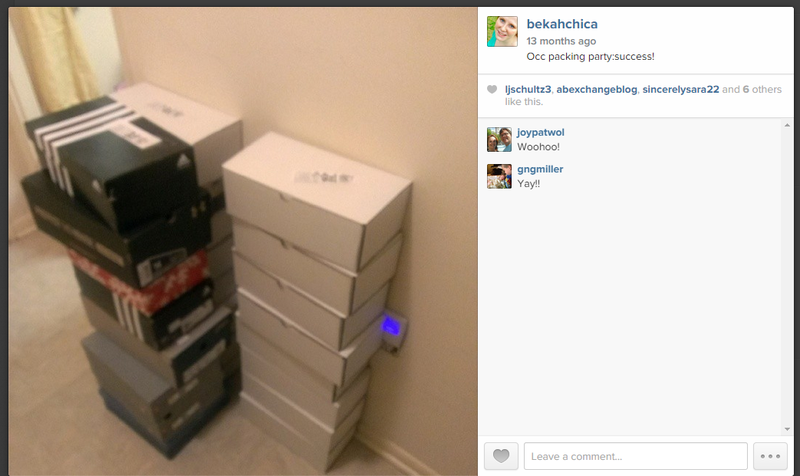 I was especially excited as this gave me the opportunity to serve and see the boxes on the next step of their journey. 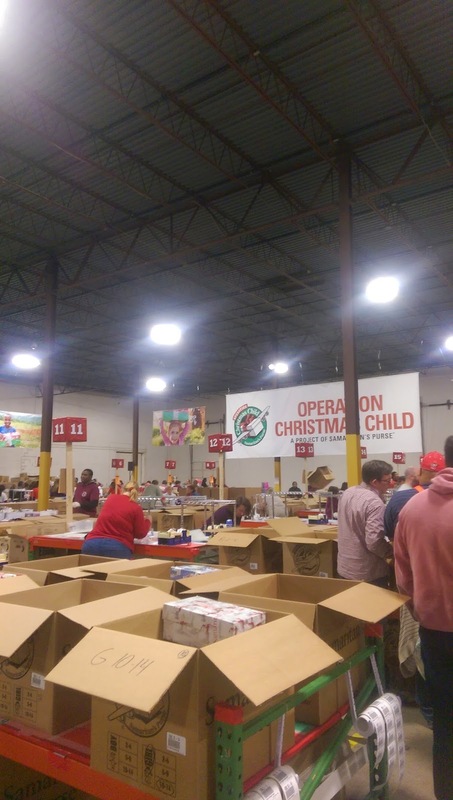 This is the last place shoeboxes go before they are shipped to the selected countries and distributed to children. I was thrilled to finally be able to go and serve: for the past two years, members of my church have traveled to the North Carolina processing center to help, but I was never able to make that work, Now that OCC is so close, I'm looking forward to taking on even more shifts next year. A common goal. What's better than people working together peacefully because they realize the impact of what's being done? Our church came in large groups and often worked together, but others were always around helping us and occasionally people we didn't know (from individuals coming in to other churches traveling from out of state) seamlessly came alongside us in the process. A new mindset. My job at the processing center was to inspect the boxes and remove any items deemed inappropriate (things not suitable for shipping like liquids or things less appropriate like toy weapons). I came across two items that initially stunned me: sewing kits and tools. I mean, give a little girl needles? A little boy nails? Soon enough, I realized I was thinking more like a sheltered American TSA agent than anything, We weren't giving these children dangerous weapons. We're giving them a chance at employable skills that can improve their quality of life! Inspiration. Piggybacking off of #2, after looking through so many boxes, you start to think "hmm, that's odd," "hmm, that maybe isn't the best idea," to "aww, that's so thoughtful," to "WOW! that is a really freaking awesome idea!" I gained many ideas for gifts to include in future boxes and even creative ideas on how to include average items in a more space-friendly manner so there's room for more items! Community. This may be my favorite part - I ran into someone on each visit who I knew...and each of those people attended different churches than me (and each other). It reminded me of the most important fact that is often so easy to forget - the church is so much bigger than a church. Interested? You can help in so many ways. Check out OCC's website to learn more, or talk to me! This post was in no way sponsored, the program just makes my heart happy!